The Constitutional Chamber of El Salvador's Supreme Court today challenged the power of the National Assembly yet again. The Constitutional Chamber today ruled that the president of the Supreme Court, Salomón Padilla, was improperly elected to the Court because of his party ties to the FMLN. Padilla has never denied having those ties. Initial reaction to the decision followed partisan lines in the country. Representatives of the FMLN and GANA decried the decision as exceeding the power of the Court. Representatives of ARENA and the PCN applauded the decision as supporting judicial independence. There was no immediate reaction from Salomón Padilla. Nor did President Funes or the candidates for his job make a comment today. The possibility exists that we might have a repeat of last year when members of the Supreme Court refused to acknowledge a Constitutional Chamber ruling that they had been improperly elected. El Salvador's Supreme Electoral Tribunal announced today the finalization of the election rolls for the 2014 presidential elections. Next year almost 5 million Salvadorans will be eligible to vote. Included in this group are almost 144,000 Salvadorans living outside of the country who will be able to vote from the exterior for the first time. The "official" campaign season recognized by Salvadoran law commenced on October 1, but the candidates have been in full campaign mode for months now. Running for the election from the left wing FMLN is the current vice president and former guerrilla commander Salvador Sanchez Ceren. From the right wing ARENA party is the current mayor of San Salvador, Norman Quijano. From a coalition of right wing parties coming under the name UNIDAD, is former Salvadoran president Tony Saca. 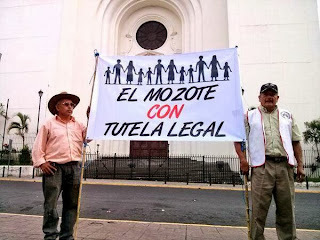 The abrupt closure on September 30 of Tutela Legal, the human rights legal aid clinic of the Catholic archdiocese of San Salvador, continues to reverberate among the human rights community. The office of the archbishop offered varying explanations for the closure as the week progressed. On the day of the closure, the explanation given was that Tutela Legal no longer had a reason to be. In a press release issued later in the week, the archdiocese stated that the closure of the offices had been done after an investigation and for the purpose of assuring a better way to safeguard, accompany and defend the rights of victims. Finally, in a press conference on Friday, Archbishop José Luis Escobar Alas stated that the office of Tutela Legal had been closed because of various "irregularities" which had been discovered in its activities. The prelate declined to provide more specifics or identify any particular employees of Tutela Legal who had been involded. Tutela Legal, the heroic legal and human rights office of the Archdiocese of San Salvador was abruptly closed by the archbishop on September 30 with no advance warning to its employees or anyone else.